The Habs completed the Super Bowl weekend of afternoon games on Sunday as they took on the struggling Edmonton Oilers. This came on the heels of a game the Habs should have won against the Devils on Saturday, so motivation to get back to winning was high in Montreal. However, the same could be said for Edmonton who also played well on Saturday but lost to the Flyers. This was the final contest between the two teams with Edmonton winning the initial contest 6-2 in a game dominated by Leon Draisaitl in the middle of a sloppy series of games for Habs defenders and goaltenders. On this day, it was the Habs that didn’t fall into the physicality that the Oilers tried to impose, sticking with the speed game and coming out on top with a 4-3 overtime victory. Carey Price was back in his crease for this contest and was faced with the now overpaid Mikko Koskinen. 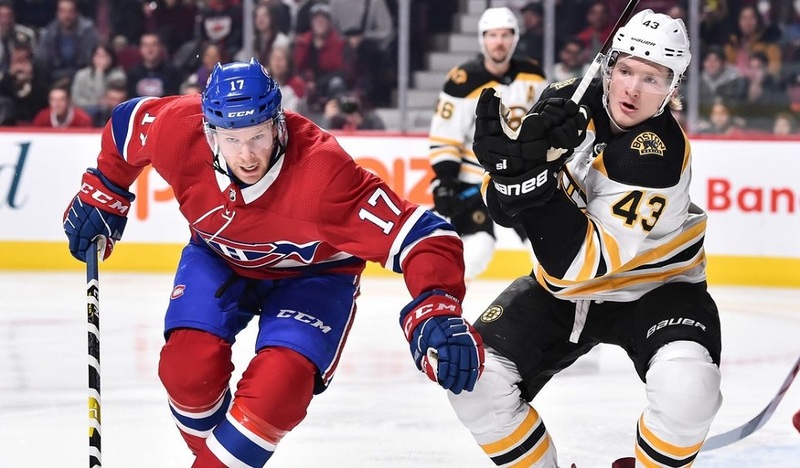 As expected, no changes were made on the blue line for the Canadiens. 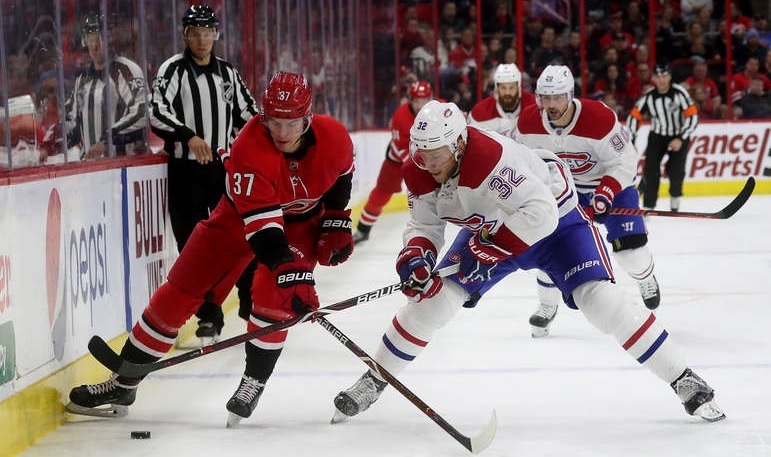 The surprises came up front as the coaching staff opted to keep both Charles Hudon and Matthew Peca in the lineup while Kenny Agostino and Michael Chaput remained sidelined. Surprise over the move does not indicate poor play by Peca or Hudon, but with two games in 24 hours, it would not have been surprising to see a switch here. The game started on a strange note as Mike Reilly turned the puck over, but he was saved by a strong defensive play by Jonathan Drouin. The Oilers were quiet after that as Joel Armia continued his inspired play on the next shift and drew a soft penalty call for slashing against Matt Benning. The power play quickly got on the board as Jesperi Kotkaniemi won the faceoff, Tomas Tatar and Armia were effective in keeping plays alive, and Drouin was finally able to feather a pass to Shea Weber for a bomb from the blue line to open the scoring. The shift after the goal included a dangerous looking play as Milan Lucic ran Victor Mete head first into the boards and Mete missed the rest of the first period. While not a malicious play, it likely deserved a minor for interference, a call the Oilers would take on the next shift when Draisaitl was guilty of a blatant penalty on Paul Byron. Montreal’s second man advantage of the day was every bit as dangerous as the first as Kotkaniemi was stopped before Armia missed two great scoring chances. Domi then opened the door for Edmonton when he crashed the net and ran Koskinen on a rather stupid goaltender interference penalty. The Oilers made him pay in the dying moments of their advantage as Darnell Nurse’s point shot hit Lucic and found Draisaitl for an open net to tie the game at the 10-minute mark. The goal stunned the Habs for a few moments as Edmonton was in the Montreal zone but they weren’t able to take the lead. Overall, the second half of the period was uneventful as both teams kept the opposition to the perimeter. Domi missed the best scoring chance of the sequence when a Jeff Petry shot went wide and Koskinen overplayed it. Domi came around the net but just wasn’t fast enough to beat the Oilers defender to the open net. As dictated by time in offensive zone, the Habs dominated the shot clock by a 13-7 margin in the period. The second started well for the Habs as Mete returned and they quickly followed with a goal in the opening minute. It was a second attempt for a Petry and Domi play, Petry missed the net but this time Domi was quick enough to bury the wraparound. On the next shift, the Finnish line dominated enough for Lehkonen to draw a penalty from Kris Russell. The first minute of the power play saw Montreal gain the zone but fail to control the puck until Drouin finally tripped Draisaitl who was also called for embellishment on the play. This brought out the second unit that was terrible. After all the penalties were expired, Jordie Benn took a hooking penalty which turned the tide of the period. 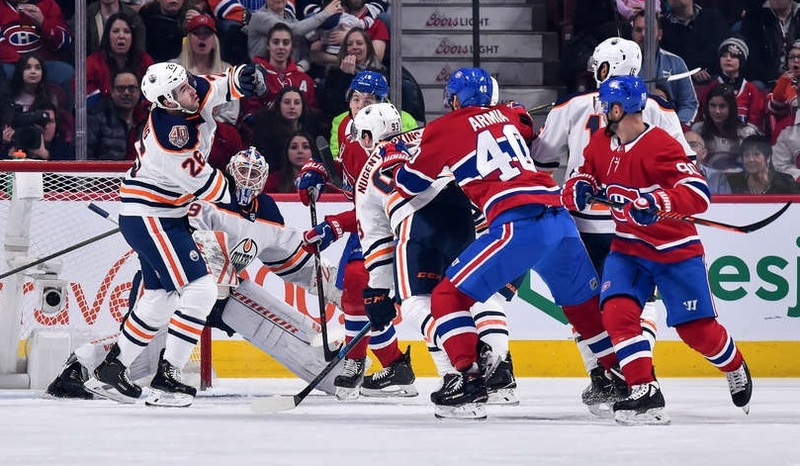 The Habs gave up two odd-man rushes on the penalty kill and finally, a Nurse point shot in the dying moments of the advantage went off a body and found Ryan Nugent-Hopkins who fooled everyone with a lateral pass to Connor McDavid who had an empty net. Byron then got hit by Benning and immediately left the ice infuriated. This seemed to indicate that Byron knew what the injury was and that he’d be missing some time. Needless to say, he didn’t return. McDavid then beat Weber with speed before Weber decided to take the penalty instead of allowing the breakaway. The end result was likely the same as the Oilers wound up scoring on the power play for a second time in the game (though the first technically came just after the advantage expired). This time, it was Alex Chiasson collecting the rebound and finding a streaking Draisaitl on the off wing to give Edmonton the lead. Montreal would finally kill a penalty in the dying moments of the period after an undisciplined Domi grabbed the head of his defender in the offensive zone. Shots in the period were 10-6 for Edmonton. The Oilers came out strong and were all over the Habs to start the third period. This was the opposite of what was seen for five periods this weekend, so maybe the outcome could be different as well. Regardless, Price was forced to make a series of solid saves against All-Star talents, notably Draisaitl who thought he had the hat trick completed. Adam Larsson then cut his own teams’ momentum when he took a Domi-esque penalty against Drouin. Both units created some scoring chances but once again could not capitalize. This started a long sequence of boring play, with the Habs trying to get the equalizer but stayed on the perimeter with the Oilers happy to oblige. This is when Claude Julien got creative in trying to spark his team. He opted to place Kotkaniemi in Byron’s spot next to Domi and Tatar. Tatar and Domi had a good shift forechecking which led to Kotkaniemi getting the puck next to the net. He used his long reach to beat McDavid to the front of the net and roofed a backhand to the top of the net to tie the game with 6:20 to play. The rest of the period saw both teams play cautiously as the out of conference matchup saw both teams desire to secure the one point. Shots in the period were 6-5 for the Habs to support my claim of an overall boring period. Overtime began with an Edmonton 2-on-1 where McDavid fanned. The Habs took off on their own 2-on-1 with Koskinen making a solid save on Domi which led to another Oilers 2-on-1 with McDavid finding Draisaitl but was stoned by Price. Off the next faceoff, Drouin got the puck behind the Montreal net and skated up the ice before pulling a move on Russell to open up the ice where he out-waited Koskinen and roofed the puck to end the game! Domi will become a polarizing figure before long. He is hard working and filled with talent, but he has these giant brain cramps in the discipline department. Love him or hate him, there is always something happening on the ice when Domi is there. I truly hope the Habs make the playoffs because I believe that Domi can be a warrior when the stakes increase; playoff hockey may see an even better Max Domi come out to play. Stats: 1 goal, 1 assist, 4 shots, 1 hit, 17:25 T.O.I. Make no mistake about it, Kotkaniemi was much quieter today than yesterday. That being said, Kotkaniemi had a whale of a third period, and this started with the nifty goal. Julien took advantage of his play to double shift him for much of the second half of the period. He was rewarded for his keen eye when Kotkaniemi tied the game. Such a fun player to watch, and he’s only getting better. Stats: 1 goal, +1, 3 shots, 17:08 T.O.I. In case anyone was wondering, the difference between Carey Price and Antti Niemi was on full display today. Much like Niemi, Price fought the puck all day long. Despite this, he made second saves and controlled the tempo of the game to help his teammates. By the third period, Price had found his game and saved them from a bad outcome and gave them time to find their game and ultimately win. Stats: 21 saves, 24 shots, 2.95 G.A.A., .875 save %, 60:55 T.O.I. This fan base was harsh toward Drouin after Saturday’s game, and rightfully so. But the fans need to get on board with the idea that Drouin will never be the player that is willing to pay the price to make the play. He is a player with first line talent that will end up on a second line due to this fact. However, unlike players like Lehkonen, Byron, Armia, and Danault who need a series of chances to score, Drouin only needs one and this game is proof. So let’s keep this in mind before running the skillful forward off a team that at times lacks talent (but not effort).